Colleges and universities throughout the world plan library orientations for first years or specific audiences such as transfer or international students. These events can vary greatly in shape and form depending on the size, resources and staff of the institution, orientation schedule, and whether it is mandatory for students. Some institutions plan day-long events, elaborate games, or scavenger hunts; some offer drop in sessions or library tours; others offer an online orientation. 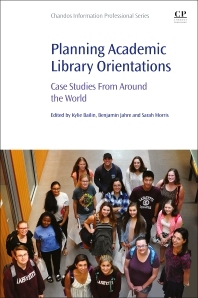 Planning Academic Library Orientations gathers case studies from around the world covering a wide variety of approaches as a guide to those revamping or creating new library orientations. Chapters are organized into the following thematic sections: Games; Marketing & Promotion; Partnerships; Targeting Specific Audiences; Technology; and Tours, and are cross-referenced if they touch on additional themes. Each chapter includes institutional information so readers can decide which type of orientation is appropriate for their own institution and see what resources are required. Sarah Morris is a Humanities Research and Digital Instruction Librarian at UNC-Chapel Hill. Previously she worked as a Research and Instruction Librarian at Lafayette College. In addition to partnering in outreach initiatives, she is interested in engaging undergraduates in original research, traditional and digital, and loves finding ways to get students in the library. She received her MSLS from UNC Chapel-Hill.